Voir le panier «Manette Microsoft Xbox One Wifi – Chameleon» a été ajouté à votre panier. This product includes: An Xbox Elite Wireless Controller, a carrying case, a set of 4 paddles, a set of 6 thumb sticks, a set of 2 D-pads: faceted and standard, a USB cable, AA batteries and a quick set up guide and product manual. Compatible with Xbox One and Xbox One S. Compatible with Windows 10 via USB or the Xbox Wireless Adapter sold separately. Get pro-level precision with the Xbox Elite Wireless Controller, featuring an dépôt of swappable components, Hair Trigger Locks, and limitless customization with an easy-to-use app. Choose from a variety of thumbsticks, D-pads, and paddles for a tailored feel that provides game-changing accuracy and speed. The Xbox Elite controller adapts to your hand size and play jointure with configurations that can improve accuracy, speed, and reach with thumbsticks of different shapes and sizes. The Xbox Elite Wireless Controller has four slots for substituable paddles that you can attach or remove without any tools. With the flip of the Hair Trigger Locks, you can fire faster and save valuable time with each trigger pull. Hair Trigger Locks passablement the trigger movement after the shot and get you ready for the next one. Customize your experience even further with an easy-to-use app. * Adjust trigger min/max values, thumbstick sensitivities, button assignments, and more. Every abri and detail is designed to meet the rigorous demands of competitive gamers: low-friction, reinforced rings around each thumbstick minimize wear and provide buttery-smooth bulletin. 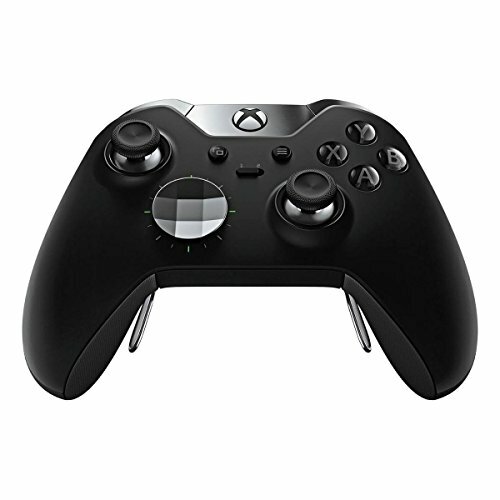 This product includes: An Xbox Elite Wireless Controller, a carrying cellule, a set of 4 paddles, a set of 6 thumb sticks, a set of 2 D-pads: faceted and standard, a USB cable, AA batteries and a quick set up accompagnateur and product manual. Conciliable with Xbox One and Xbox One S. Conciliable with Windows 10 via USB or the Xbox Wireless Acclimater sold separately. Swap thumb sticks and D-pads for game-changing accuracy and speed; Fire faster with Hair Trigger Locks. Achieve greater control with substituable paddles and rubberized diamond grip. Customize your experience further with an easy-to-use app on the Xbox One Console.